MeritMade Commentary - So, you want to be a maker, eh? Kelly is a maker, through and through. 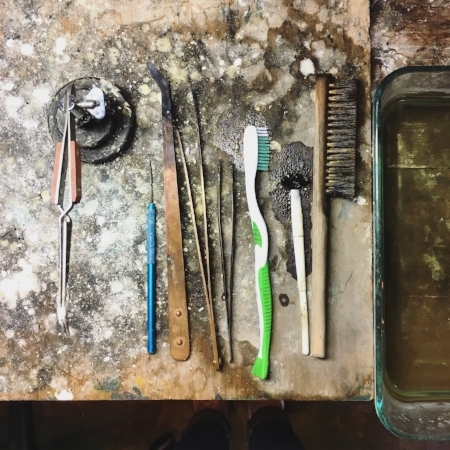 While metalsmithing is how you know her, this woman is CONSTANTLY making across a broad range of crafts and mediums. Her wedding thank yous were handmade, featuring a carved stamp of her and her husband. She has been kitting the same gold shawl with the tiniest yarn for at least 7 years. She built the table that is the center piece to our workshops. She welded the steel displays that we use at shows. She loves any excuse to gift wrap. She has started AND finished multiple quilts. I could go on for a long time. To say Kelly loves to work with her hands is a massive understatement. When we meet people at shows or in workshops, often they will express a wish to be a maker of some sort. She is immediately excited and encouraging. If you haven' been privvy to one of her gushing recommendations to use your hands, I give to you Kelly’s tips to becoming a maker. Enjoy! Find something you love to make. What do you want to create or improve? Many people are drawn to specific types of materials. Perhaps getting your hands dirty is an important component or maybe you absolutely must work from home. Before you get started, it is smart to consider what sorts of things are important to you. For example, if you hate computers, maybe robotics shouldn't be your thing. Get educated. There are so many workshops, in-person class, online videos, and educational resources out there. Searching YouTube is a great way to get started. When you are ready to pay for education, sites like Craftsy (www.craftsy.com) do a great job of providing a more thorough online education for a small investment. Don’t forget about your local guilds, clubs, libraries and schools. Often these places are wonderful for learning. Buy some tools and materials. This can be a bit daunting. How do you know which tool is right? Do you get the expensive one or the cheap one? It is really all about budget. Determine what works best for you. I started out with the cheapest tools and materials, because that is all I had the money for. Some of them are still operational today, and some I have upgraded and replaced. It is always a work in progress. That all said, great tools can really make a difference in saving time and making a task much easier. DO IT! Don’t be scared, you have nothing to lose. Besides, how will you know if you like it if you never try? Seriously, you have to start somewhere. Dive in head first and don’t be afraid to change your mind. Find and Expert, and become their best friend. Plan a visit to their studio/shop/home/company, or take them to coffee to pick their brain. Most are happy to share and pass along the knowledge they have. You could also offer to help them. I don’t know a single maker who couldn’t use an extra set of hands. In exchange for your help, you would be getting valuable hands on training and experience. Support other makers and get inspired. Go to a craft fair. Go to meetups. Join a Facebook group. The maker community is a welcoming place full of knowledge and inspiration. Support it with your presence and if possible, your dollar. These people work hard, and by supporting them you are fostering an environment where makers are respected and can continue creating. Remember, a maker is simply a person who makes something. Have fun, explore, and most importantly create what YOU want. Sounds like pretty legit advice to me! I would add be patient; you will not be instantly amazing at your new craft and that is perfectly okay. In fact, it is the process of learning, trouble shooting and perseverance that makes being a maker so awesome. MeritMade Commentaries - NOT THIS YEAR!! Oh no it’s already AUGUST! Holy moly where has the summer gone? Our thoughts are shifting towards fall and back to school. The hot summer days are numbered. For me this means that I have to start thinking about DUN DUN DUUUUN!! !, the holiday. As someone who ultimately produces goods to sell, the holiday season is one of the most productive and crazy times of year. Jewelry is a popular gift item, and I would be a moron not to have jewelry made and accessible to the buyer. Yep, that is you! I remember last year, I spent every night at the studio. I didn’t have a plan. All I knew is that if I could just keep making stuff, I would be OK. By the end of it, I was completely burnt out. Looking back, I’m glad I worked that hard, but did it really need to be so stressful. I could have genuinely benefited from a goal and furthermore a plan to reach that goal. For those of you who know me personally, you know that goals and plans are probably two of my biggest weaknesses. I’d rather fly by the seat of my pants. See where the wind takes me. You know, live life as an adventure! The unknown/unplanned, although fun, is just not going to cut it this year! So I'm going to do it. I'm going to go against all of my internal being and I am creating a plan! And dangit, I'm going to do my best to stick to it. The first step of the plan is to make myself and my work more available. I refuse to start an etsy and drown in the sea of terrible jewelry, so that is out of the question. Facebook for business doesn't seem to be all that good at showing you my content unless I pay for it. Followers on instagram are awesome, but it's essentially useless if you want to post a link. So I'm taking matters into my own hands. I want to build up my mailing list. I want to supply to you all good content. I want for members of my mailing list to get the first chance to buy something, before anyone else. To be able to purchase a unique one of a kind piece of jewelry that will last a lifetime. I'm even considering making a members exclusive line. I want for shopping and working with me to be as easy, awesome and fabulous as possible.